Locally known as the Perigord, the Dordogne Valley in France is touted to be the home for the most beautiful villages in the area of France. 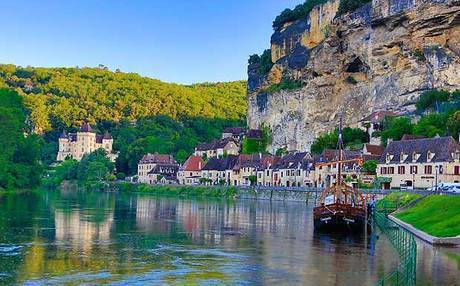 Unlike other locations in France, the Dordogne is not much well known in the country, but is considered one of the most beautiful and fascinating spots. This article discusses some of the famous sites in the area of the Dordogne, and what are the things to do in Dordogne. Domme - The Dordogne takes pride in this place as a village located on top of the cliff overlooking the valley and certainly is a place that tourists should see at least once in their lives. From the eastern side where the Montfort meander is to the side on the west where Beynac lies, tourists are offered spectacular viewpoints from this area in the valley of Dordogne. Be taken back to the history of the Medieval age as you are offered breathtaking views of the tranquil river and the lush fields of crops in the area. The village of Domme was discovered by Philip the Bold back in the year 1283 and actually is a more recent village compared to the areas in the area. Bastides are referred to as newly founded towns in the French region of Dordogne, which were planned out to have central plaza and market area. This period in France, there have been many bastides and villages that have existed, as accounted in history. Still open today, the village of Domme is perfect to visit during market days when tourists can find homegrown fruits, vegetables and homegrown chesses, cured hams, olives, sausages and the staple of the Dordogne called the foie gras. You can visit the local Dordogne tourism agencies and offices to learn more about the place and how you can enjoy Domme like no other. La Roque Gageac -- La Roque Gageac is known as a village that is situated, not on top, but against a clip that falls vertically into the Dordogne River. This village takes pride in many local attractions such as houses, churches and manor houses, one of the most widely known and visited is a manor that was once owned by the renowned family of Tarde. One can see native tropical plants abundant in the area that are protected by the cliff against extreme weather conditions such as the winter season. What to see in France ? Behind the houses and village buildings is a walking path located on the lower part of the cliff, where tourists can take many great shots overlooking the village. Near the area are caves that tourists can take a look at. Beynac - One can find Beynac around two miles down the road. The Chateau de Beynac is a famous site located above rock that can provide breathtaking views of the Dordgone Valley, with castles and hills around the area. To learn more about France, you can visit https://en.wikipedia.org/wiki/France .